The music was originally foisted upon the public as a Sicilian air. Bishop had been commissioned to include a Sicilian air in a collection of songs, and not having one he undertook to make one. 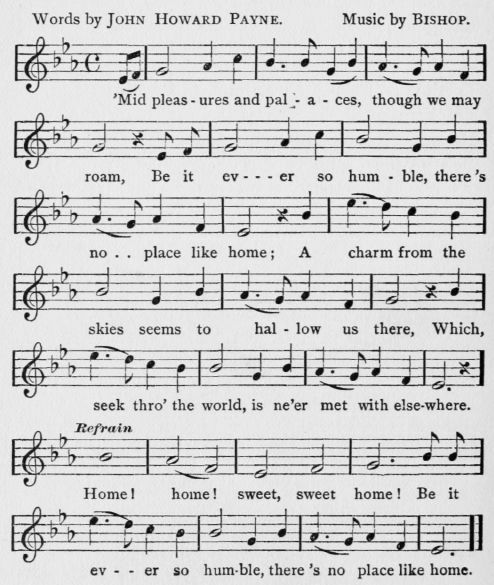 Payne, the writer of the verses, said of himself: " How often have I been in the heart of Paris, Berlin, London, or some other city, and have heard persons singing, or hand-organs playing ' Sweet Home ' without having a shilling to buy myself the next meal or a place to lay my head! " Three hundred thou�sand copies of the song are said to have been sold; but the author got nothing above the �250 received for it as originally written for the musical play of " Clari, the Maid of Milan." This was in 1823.